Yoga has become one of the most popular forms of exercise today. Not only does it give you physical wellness, it has been proven to be good for mental wellness too. At DSFI, we have a session of Yoga for persons with Down syndrome on a regular basis.This therapy requires active involvement of the parent/caretaker as more than a physical exercise it’s an attitude that needs to be cultivated. Chanting and Clapping as a game to aid in hand-eye-speech co-ordination. Asana the physical postures help physiologically as these babies arrive with very many health complications. Working on the Entire Neuro-endocrine System, it regulates the hormones bringing about a balance psychologically as well. Simple Breathing techniques aid the respiration due to the narrow and blocked nasal passage resulting nose-breathing as to the ‘general’ mouth-breathing habits. Breathing also brings about a balance in the left and Right hemispheres of the brain. Kriya practices such as Netra Vyayam(eye exercises) and Tratak (a method of meditation that involves staring at a single point such as a small object or a flame) regulate pituitary and pineal glands decreasing the possibility of the Cataract by strengthening the Optic Nerve. Nidra and Mudra’s allows the above practice to be assimilated and sealed not permitting the energy to dissipate. Keeping the child more alert during the rest of the day. Initially though the Therapists needs to connect with the child assessing his/her own individuality. Trusting (the child as well as the self) that there shall be progress, accepting all the challenges fearlessly. And last but not the least Love him/her without much expectations. We can divide Child development into three stages. There is a physical development happening.The child is getting used to the new costume (physique)in its life.Attains the milestone in addition to the development of internal organs.We call this as the development of Annamaya Kosha.In introducing yoga practise at the appropriate time ,it helps the child develop completely. How do we do in yoga? Children at this stage are imitative.Dynamic yoga postures and Vinyasas are given .Without considering breath as a major component ,we work with the physique ,which in turn trains the breath component indirectly.A teacher who is dynamic introduce yoga in a playful way.Breath component is replaced by Chants.Parents at home if they do Yoga as a part of their daily routine then the child picks it up too through its imitation. What happens in our children? Our children have hypotonia,Floppiness in muscle.They are very flexible but lack strength.So their muscle need to be first strengthened and coordinated,which happens through yoga . This is the second phase of development,where the child is stepping to another phase ,Puberty which has two stages-Pre-puberty and Puberty.Pre puberty is preparation stage for puberty which is very essential for the puberty stage.Now a days not much time is provided for the children due to present lifestyle and media influence.thus ,the child enters the puberty without emotional maturity. What do we do in Yoga? At this stage ,there ia a gush of Oestrogen for girls and testosterone in the boys. Boys-We work on the musculoskeletal system to give strength through directing the hormones energy there.Vinyasas through stay postures and chanting .Through stay in the breath,the mind is calmed since they go through emotions.More of physical activity.Martial arts,Swimming ,Playing Tabla,Drums,any instrument complements Yoga. Girls-To meet the oestrogen(nurturing),we focus on the reproductive organs,more on exhale component.Yogasanas with chanting will help .Carnatic music,playing veena ,violin complements yoga practise. What happens to our children? Our Children has a strength of the middle realm – the rhythmic system.They are so emotionally rich that can be used as a strength to express in drama,Play etc. rhythmic system.They are so emotionally rich that can be used as a strength to express in drama,Play etc. This is the phase ,the child develops self esteem and self confidence Physique and mind must be fit enough to meet the challenges. So Focus more on mastering the breath is given .Meditation to bring focus and clarity in thoughts are done. Our children being so giving from the middle realm , they use up their life forces to connect with the world. When they connect they just give themselves .If by chance the connected person move away from ,for example the teacher/special educator moves away, then they enter into a state called withdrawn in,losing the gained faculties ,a state called YADS-Young . This is very important to know that it is possible to get them back through art and music.If it is overlooked as something else then it becomes totally difficult.So Chanting brings in a lot of healing through filling their middle realm.Vedic Chanting has many healing chants which will help the child. By providing Yoga we indirectly work with hormones through harmonising it.In a group of children,the same set of asanas and pranayama will be recived by boys and girls differently. Yoga is for everyone.By providing Yoga from the childhood,it channelizes the energy reducing the blockage.By this way,holistic human being is developed which is an asset to the Soceity. Dynamic Asanas –The purpose of this to bring Physical Coordination and the goal achieved is less restlessness. Vinyasas- The purpose of which is to bring in alignment and balance,improve circulation and Improve digestion .The goal is achieved through improve the gross and fine motor skills. Yoga brings about the holistic development of the Child.As parents if one makes yoga as their regular practice and introduce it to the child ,then the child perceives it as a part of their living and not a therapy. At the Tamil Nadu Para Sports State Championship held in Madurai from the 26-28 January 2018, Ms. Arti Krishnamoorthy, a person with Down syndrome won 3 medals in swimming – 1 gold and 2 silver. The Gold was in the 50m backstroke and the Silvers in 50m Freestyle and 100 m Freestyle swimming. 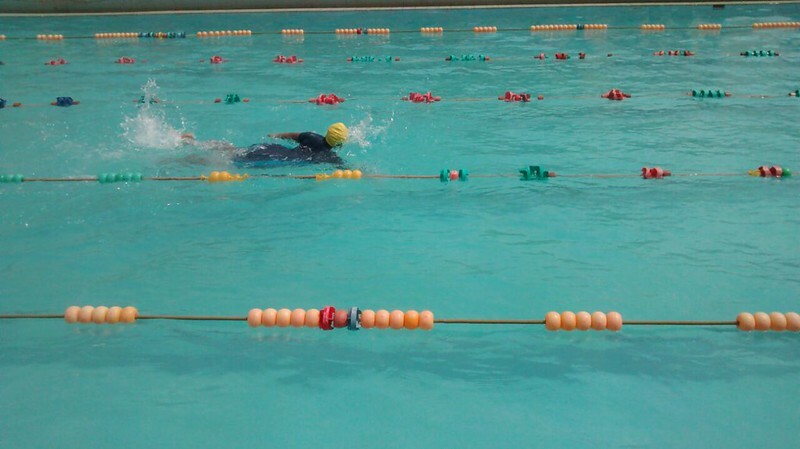 Arti is an avid swimmer and cyclist and has already won medals at various international meets. Congratulations to her and wishing her more success and laurels. We are proud of you Arti.